Valid on In-Park purchased only. Does not apply online. 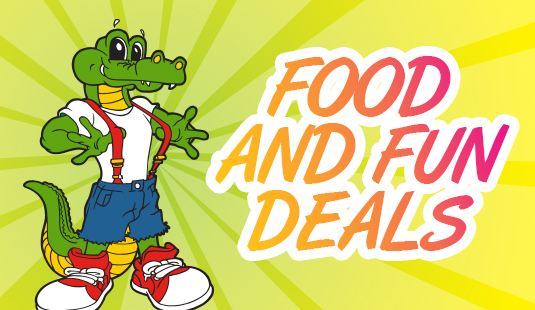 Andy Alligator’s is saluting teachers on Saturday, April 27th and Sunday, April 28th. Show your teacher ID to receive a FREE All-Day Pass. Plus, up to 4 family members can save $5 on an All-Day Pass. 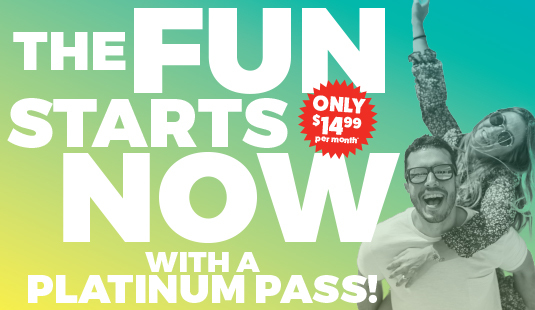 Don’t wait until summer - the FUN starts now with a Platinum Season Pass! For just $14.99 per month get unlimited access to the water park AND a daily 3-Hour Fun Park Wristband that can be used all year long. Wipeout and the Sling Shot will be added to the Water Park for the 2019 season! Get a Large Pizza, Pitcher of Soda, and $50 Game Card for just $54.99! ½ Price Arcade Games! Excludes prize games. Kids Eat FREE. One free Kid’s Meal with every purchase of $14.99 or more. Ages 12 & under. $89.95 Family Pack - Save $40! Includes 4 wristbands, a one-topping Pizza & Pitcher of Soda.